Basements, especially ones in older homes, tend to be prone to moisture buildup. The rest of your home might be dry as a bone after a heavy rainfall, but you might still notice some residual moisture on the interior walls of your basement. If left unchecked, this moisture buildup can contribute to mold and mildew growth. By taking a few simple precautions, however, you can keep your basement nice and dry and keep mold growth at bay. Clogged gutters and misdirected downspouts can cause rain to pool around your home’s foundation, inviting moisture into the basement. Clean your gutters at least twice a year, and ensure that all downspouts carry water away from your home. 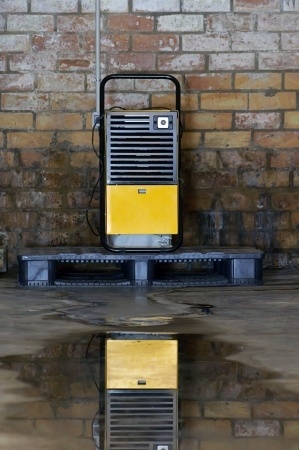 A small dehumidifier unit can prevent excess moisture from building up in the air in your basement. You made need to use more than one unit depending on the size of your basement. Once it’s full, you can use the excess water in your garden! If you notice that the bare interior walls in your basement tend to “weep” with water droplets, it’s a good idea to cover them with a water resistant paint. This won’t prevent moisture buildup in the basement, but it can prevent mildew growth on the walls. Cold water pipes tend to be condensation magnets, especially if left exposed in a basement. Insulating pipes can keep that condensation from contributing to additional moisture buildup. In more serious cases where water pools on basement floors following rainstorms, you may need one of these pumps to keep your home dry and free of mold. Sump pumps should be installed in a recessed hole at the lowest point in your basement so that water flows into it rather than accumulating on the ground. Once water levels reach a certain predetermined point the pump will activate, carrying the water up and away from your home through an outlet pipe.